I beg your pardon? So what if I'm one step closer to being one of those middle-aged women who wears an elaborately embellished seasonal pinafore and makes crafts full time. What of it? What have you ever done with your life? Also, please note the sassy peacock feathers. You did that while you have bronchitis? I can't do that when I'm completely healthy, don't have a toddler harassing me, and am hopped up on caffeine. You put me to shame. Um, I have made several wreaths over the past few years. Clearly, those crafty old ladies ARE US. I'm under 30 and made a wreath in September (no sassy peacock feathers), not to mention I crochet so I really feel old. Welcome to the club! Catherine—I really believe the feathers added something special. tracyellen—I don't like to call myself Wonder Woman. But if you'd like to, that's fine. Sharon—Let's wear matching embroidered vests! Danielle—The thing is, people still think I'm really young because of my baby face. But then I have all these elderly habits. I'm like Benjamin Button only backward. 2. That wreath totally rocks! rock on erin. i dig the wreath. i might have to bust one out since this is the first holidays i'll spend with my husband...and he is STOKED about decorating! stephanie—I find myself emotionally affected by holiday decor, more so since having Ethan. The pinafore might be interesting, just don't start wearing seasonal sweatshirts with applique, OK? 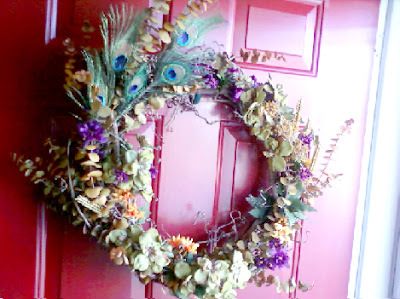 If your collected wreath pieces were locally grown and sustainable, it would be a hip, cool thing to do. So, were the peacocks free range? LOVE the wreath! Am going to try to make a coffe-filter one myself (http://www.thenester.com/2010/11/making-a-coffee-filter-wreath-and-tree-and-things-of-that-nature.html), so rock on with your bad self!